And with all the channels and screens that customers are using – plus all the data that results – poor integration makes it hard to understand and respond to all the journeys that customers take to interact with your brand. When your marketing tools are integrated, you can use all the rich behavioral insights you’ve learned about your customers to make their experience on your site better. You can quickly identify areas of your site that can be improved upon and more easily tailor your site for specific audiences so your business can provide the optimal site experience to each customer. That’s why we created Google Optimize 360 (beta). This new testing and personalization solution is built with full native integration for all the data that matters to your business. One data source. Work with confidence as your web analytics data and experiment data can now work together in one tool. Experiment and business objectives are the same. Many businesses already use Analytics 360 to measure key activity on their site as they make critical business decisions. Now their experiments can easily test against those same activities. Simple, powerful personalization. It's easy to use the Analytics 360 segments you’ve already discovered to deliver more personal web experiences. Refresh your site messaging or re-imagine the entire customer journey — just about anything is possible with the easy-to-use visual editor in Optimize 360. 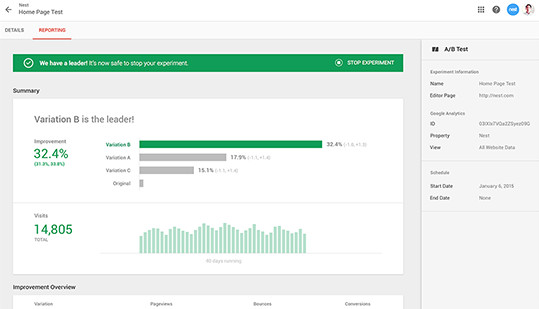 Once you’ve created a new variation of your site to test, you can select your Analytics 360 goals as experiment objectives and target your Analytics 360 audiences. After you’ve launched your experiment, you can review experiment reporting that matches your web analytics reporting. It's both easy and powerful ― because testing and personalization are seamlessly integrated with Analytics 360 from start to finish. Many Optimize 360 customers have seen first-hand the benefits of an integrated and simple-to-use testing solution. The Motley Fool is one such customer. The Motley Fool is dedicated to helping the world invest — better. The company was begun by brothers Tom and David Gardner in 1993 as a simple investing newsletter for family and friends. The Motley Fool is a global financial company now, but newsletters remain a key product. During regular reviews of their Analytics 360 data, The Motley Fool team began to see a weak link in the sales chain — email campaigns were driving visitors to the newsletter order page, but a high percentage of those sessions weren't leading to an order. The Motley Fool team began experimenting with ways they could make the newsletter order process as simple and easy as possible for their users. They used Optimize 360 to put their ideas to the test and measured their results against an already created Analytics 360 goal that was measuring newsletter orders. “The ability to use our existing Analytics 360 data in a testing platform was huge for our team,” says Laura Cavanaugh, Data Analytics Manager for The Motley Fool. “Our server-side event tracking for key metrics like leads and orders is 99% accurate — far better than with other sources." Even before results came in, Optimize 360 made a big impact on The Motley Fool team by saving valuable time and resources. “One of our marketing managers can set up a test from start to finish in less than 10 minutes,” says Cavanaugh. When the experiment results did come in, they were clear and powerful. The redesigned order page resulted in an improvement in conversion rate over the original order page. And The Motley Fool isn’t stopping there. Now they plan on testing new elements for many different audience segments, like better landing pages for new prospects and custom experiences for loyal customers. And having the combination of Analytics 360 and Optimize 360 gives them a more complete view of the greater business impact each of their changes have. Read the full case study with The Motley Fool for more details. This is only the beginning. In the coming months we’ll share even more product features and integrations that we’re now building into Optimize 360, so you can take seamless action on your Google data wherever it exists. Want to learn more? Visit our website to read more about Optimize 360.